Police said the woman had a cardboard sign saying, "Please Help me feed my Baby"
A woman who gave money out of her car window to what looked like a needy young mother was then stabbed to death by a man who tried to steal her wallet, Baltimore police say. 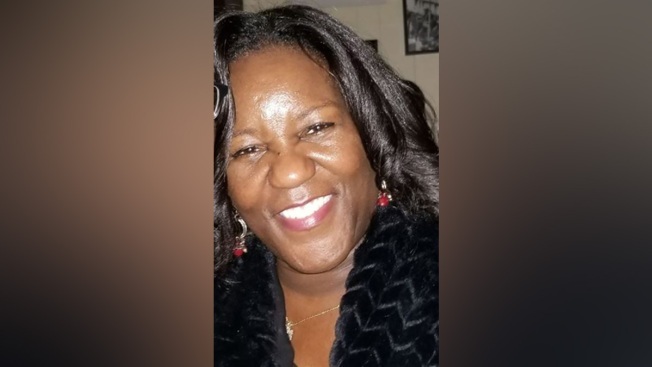 Relatives of a Maryland woman who was knifed to death in front of her family while trying to help a panhandler said Monday that she died the way she lived: looking out for others and trying to be kind. Authorities say Jacquelyn Smith, an electrical engineer from Maryland's Harford County, lowered her car's front passenger side window in Baltimore early Saturday to give money to a young woman who appeared to be holding a swaddled infant and carried a cardboard sign reading: "Please help me feed my baby.'' Authorities say a man approached the car with the woman for the cash handoff. After a struggle over Smith's wallet, he stabbed Smith and fled on foot with the panhandler. Smith's grieving 19-year-old son, college sophomore David Hood, described his mother as a strong-willed woman who always taught her children about the importance of generosity and family. He told The Associated Press that she was in the car with her stepdaughter and her husband when she was fatally stabbed in the torso. Her husband, Keith, was behind the wheel at the time. "I think it was a split-second decision of wanting to help somebody else. She really cared for everybody. She loved everyone and was very compassionate,'' her son said in a phone interview from the family's home in Aberdeen, a suburb some 25 miles northeast of Baltimore. There have been no arrests in the murder of the Good Samaritan. A law enforcement team went Monday to the East Baltimore intersection where Smith was slain to hand out flyers and canvass residents. The young woman investigators are seeking appeared to be about 20 and the man was roughly 30. Mayor Catherine Pugh described Smith's slaying as a "terrible tragedy'' and said the city was "deploying all available resources within our police department to find and bring to justice those responsible for this senseless act.'' She urged altruistic people to be cautious. "Particularly in this season when we are inclined to give to those we perceive to need a helping hand, we urge all to exercise extra judgment and caution,'' Pugh said in a Monday email. Smith's husband, Keith, told WMAR-TV that she felt moved by the sight of what appeared to be a struggling young mother with a baby standing by an intersection on a cold drizzling night. After his wife waved the young woman over, he said a man emerged "out of nowhere'' and came walking over to their car alongside the panhandler. With the car's windows down, he said the man asked him if he could thank his wife. "And within that split second this guy commences to stab my wife,'' he told WMAR. The Baltimore Police Department said the male suspect "reached in to grab the female victim's wallet when a struggle ensued.'' He stabbed her during the struggle, according to a police statement. Jane Piliavin, a professor emeritus of sociology at the University of Wisconsin who authored a book on emergency intervention, said women are more likely to respond to a child in trouble than are men. She didn't believe there would be any sustained local impact making people less inclined to assist panhandlers after the Good Samaritan's murder. "Probably there is a brief impact on others' interventions. Since most intervention is impulsive, I would not expect much of an effect,'' she said in a phone interview.